The selection of the style maybe suggested by the University or by the tutor (in the case of an academic work). It can also be recommended by a journal or congress, in the case of researchers publications. It is the mention inside the text of the academic work or scientific document of ideas, sentences or documents, remitting the reader to the source from which the information has been extracted. The bibliographic citations are built according to the chosen style. It is an structured description that specifies, in a detailed form, the document from which the information has been obtained, allowing its identification and telling us its main characteristics (author, title, publication date, etc.). These data form the bibliographic reference, made up following the guidelines of the chosen style. A bibliography is the ordered list of documents consulted during the preparation of an academic work or investigation. A list of references: it is the ordered list of documents cited in the research work. Different styles and international standards may be used to cite and list bibliographic references, depending on the scientific field. The bibliographic styles collect the guidelines with the necessary elements for each type of document, its sequence and the typographic format. The style or standard can be recommended by the professor, by the own institution or university, and in the case of scientific publications, by the journal or congress. Here you have the most common styles and standards with some guides prepared by the Library staff. The ISO standard proposes a general frame with a series of guidelines to prepare bibliographic references and citations of bibliographic resources (digital or printed). The current edition is the ISO 690:2010, translated to the spanish: UNE-ISO 690 Información y documentación . Directrices para la redacción de referencias bibliográficas y de citas de recursos de información. You can consult the help guide elaborated by the Library. The Library offers training sessions about this standard. The APA style (American Psychological Association) is the bibliographic style used mainly in Psychology and Pedagogy; also in other disciplines like the Social and Technological Sciences. 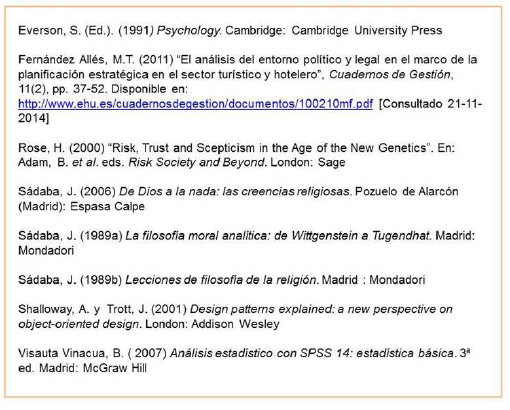 The last edition of this bibliographic style is the 6th (2010). The Library offers training sessions on this bibliographic style. The CSE style (Council of Science Editors) is used in the areas of Biology and Natural Sciences. The 8th edition of 2014 is the more recent. The MLA style (Modern Language Association of America) is used fundamentally in Humanities, especially in the area of Language and Literature. The last edition of this bibliographic style is the 8th (2016). It is mainly used in Biomedicine. It is based in the style developed by the National Library of Medicine (NLM) for its databases. Examples of the different formats for bibliographic references can be found in: Citing medicine: the NLM style guide for authors, editors, and publishers. The last edition of Citing Medicine is the 2nd (2007). The University of Chicago published in 1906 an style manual, updated in successive editions, used in History, Humanities, Art, Literature and Social Sciences. The last edition published is the 16th (2010). The Library offers trainning sessions on this bibliographic style. It was developed in the University of Harvard (USA) in the 50s. It is mainly used in Physics and Natural Sciences; in the late years, also in Human and Social Sciences. The Library offers training courses on this bibliographic style.